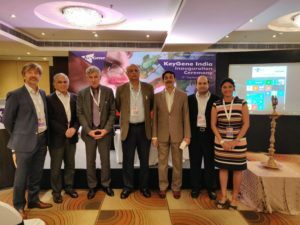 KeyGene recently opened its representative office in Hyderabad India. To mark the opening of its facility, KeyGene organized a mini symposium on “ The Impact of New Breeding Technologies in Agriculture” in Hyderabad on 3rd September 2018. The function was inaugurated by the chief guest, Mr. Jayesh Ranjan, Principle Secretary Ministry of IT, Telangana state, and the keynote speakers Mr. Ajit Rangnekar DG, Research and Innovation Circle of Hyderabad (RICH), Dr. B. Sesikeran, the current chairperson of the Regulatory Committee for Genetic Modification (RCGM) India and Dr. Arjen van Tunen, CEO KeyGene N.V. The speaker representing the seed industry was Dr. Bharat Char from Mahyco; from the government regulatory body was Mrs. Sangeeta Agarwal from the Department of Biotechnology (DBT) and from the biotechnology company was Dr. Edwin van der Vossen from KeyGene N.V.
Biotechnology is a powerful tool to transform agriculture. we need high quality biotech platforms that can work on addressing issues being faced by the Indian farmers. in that context, I welcome the decision of KeyGene to set up their facilities in India. 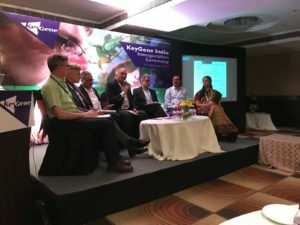 The session was well received by all participants and Keygene’s efforts to organise it was warmly welcomed and KeyGene was congratulated on becoming part of the Indian seed sector as a local player. KeyGene India is located in the Hitech city at Raheja Mindspace. KeyGene welcomes breeding companies and the agro food companies to visit its office and look forward to solve their challenges in the crops of their interest.